Our newest design is a tray cleaner which incorporates unique rotating nozzles to achieve maximum coverage and cleaning effectiveness with minimum water consumption. The machine uses 8 to 12 gpm including the rinse section. Standard equipment includes a booster pump to operate the washing nozzles at 120psi or higher depending upon inlet pressure and all stainless steel construction. A destacker for non-nesting trays is included with a fully variable speed drive. With the standard booster pump loose dirt is washed off the trays and collected in the 4" drain. Optionally, a pressure washer pump can be connected to the rotary nozzles for thorough cleaning including removing plugs without roots; for use with injection molded trays only. 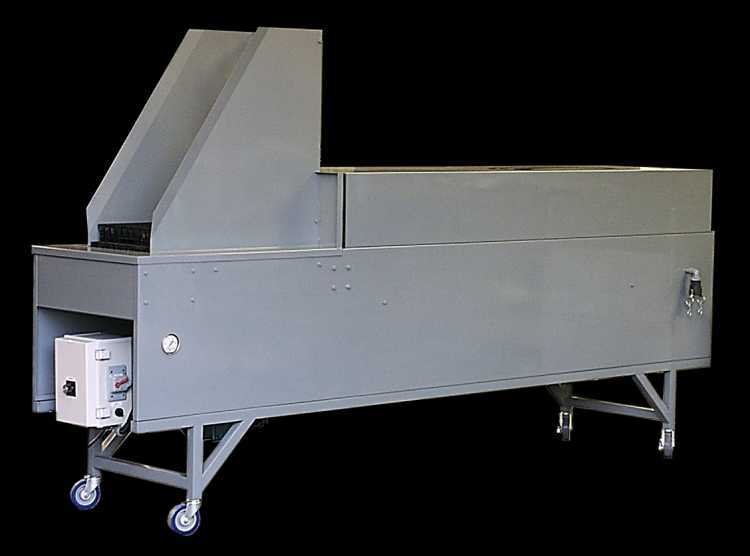 Variable conveyor speeds up to 1000 trays/hour are standard using an inverter drive. Power requirements: 220vac single phase, 1/2hp conveyor drive-pump requirements depending upon pump selected.